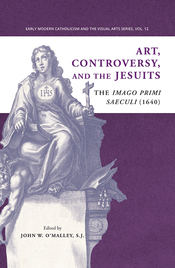 John O’Malley’s Art, Controversy, and the Jesuits: The Imago Primi Saeculi, available through St. Joseph’s University Press. The Imago primi saeculi Societatis Iesu, a 952 folio-sized volume of poetry, prose with 127 exquisite copperplate engravings, celebrated the Society’s centenary in 1640. The publisher calls O’Malley’s text, “the most comprehensive study of the important book ever to appear.” Michael Putnam (Brown University), Marc Fumaroli (l’Académie Française; as translated by Paul Young of Georgetown), Jeffrey Muller (Brown University), Marc Van Vaeck, Toon Van Houdt, and Lien Roggen (all of Katholieke Universiteit Leuven), and Alexander Sens and James Walsh (both of Georgetown University) contributed the volume.